Discount Dr. Strange and our first servant strikes! As he strikes, the strange figure delivers a foreboding message about the future and darkness. He wants the wand and will destroy anyone in his path. He smacks Superboy away immediately and freezes Cosmic Boy in his place. Phantom Girl avoids an attack through phasing, but the immense cold inside the creature stuns her. Invisible Kid and the curator are now in the creature's path. A recovered Superboy rushes to save them, but as he flies away with them, the curator drops the mentachem wand. The strange creature collects it. He calls out his success to his master. With a "ploink" a portal opens and the caped figure escapes to places unknown. After a few pages inconsequential to our story, we return to the five heroes as they fly over London. The curator explained the wand wasn't the first magical artifact stolen. The curator guessed that Excalibur would be the next target and its home was now the Tower of London. 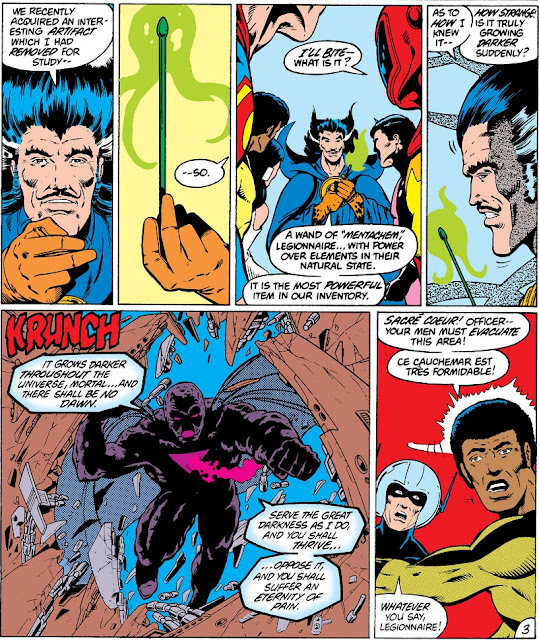 They encounter a few tourists as they make their way in, but before they can enter the vault that holds the blade, Wildfire and Cosmic Boy are blasted with a "kablooooooom!!!" While the rest of the team handles clean up, Invisible Kid sneaks inside. A similar figure to the last, this one shorter than human with a large cranium, tries to steal the sword. Wildfire strikes and Invisible Kid uses the distraction to grab the sword and turn invisible. A blast of magical light knocks Invisible Kid out and Big-Head grabs the sword. He takes a huge hit from Wildfire, but he quickly calls to his master and pulls the same vanishing act as the other being. After another aside at Legion HQ, our scene switches to the same blasted world Mon-El and Shadow Lass visited three issues before. Darkseid, in an outfit unlike anything he's worn before or since, but with his visage still cloaked in shadows, praises his "mockeries" for a job well done. We see two more such figures as well, two more beings we haven't yet see in battle. He absorbs the power of the blade, declaring, "but even the darkness must feed, if it is to grow!" We skip ahead after a brief discussion about their next move. The five heroes, alongside Shadow Lass as well now, have come to Talok VIII, a world cloaked in Legion infamy. Brainiac 5 predicted it would be the target of the next attack due to the presence of the Orb of Orthanax. Before they can reach the orb though, their path is cloaked in total darkness. The female of the mockeries has powers similar to Shadow Lass. Wildfire lights up the room with his own power, but he can't stand against the servant's dark powers. Before she can grab the orb though, Cosmic Boy yanks it away with his magnetic powers. The servant moves to blast Cosmic Boy, but Superboy flies in to intercept the strike. At first, it seems as though the attack might have hurt him, but Superboy shrugs it off and knocks the servant back with his super breath. 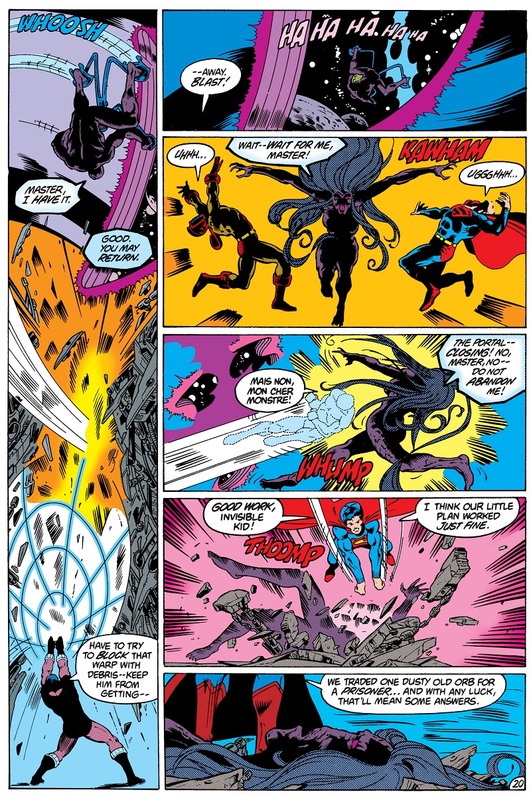 Phantom Girl grabs the orb while Wildfire and Superboy blast the servant into submission. But even as victory appears to be in their grasp, another ploink brings another figure into the attack. This mockery rides an astro-glider and before Phantom Girl knows to react, he blasts her and grabs the orb. The mock-Orion disappears back into a portal. The female servant tries to escape into the portal, but Invisible Kid smashes into her . Superboy delivers the final blow and things have gone as they planned all along: they were willing to lose the orb in exchange for a prisoner. his amazing ability to cram tons of action onto each and every page. As the team is informed that member Chameleon Boy will soon stand against charges for treason (due to events of a previous issue), our away team arrives with the shadow creature. 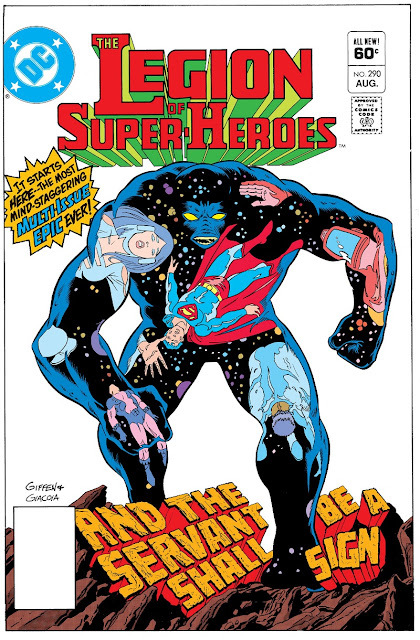 As Superboy and Shadow Lass bring the creature to the medical chamber, it drives the linked young girl and computer known as Computo into a nightmare. The mock-Orion arrives with the Orb of Orthanak. Any question of his identity comes to an end as the dark presence says "Place it before me, lowest of the low, most loyal of my servants, my son." Darkseid sends the misshapen figure away as he again absorbs the power from the magical artifact. Darkseid declares his powers on the rise and that the need for magical artifacts is in the past. The next phase of his quest will take him where he can steal life itself! It's fascinating reading these books in hindsight in a collection plastered with Darkseid's face. The mystery of the strange destroyer and his misshapen servants is peppered with clues (such as the astro-glider) but the mystery would serve to increase the intrigue. Yet even without that mystery, the tale shapes up as a solid launch to an epic confrontation. I can nitpick of course: ask why the team wouldn't have sent a few more members to the Talok VIII confrontation after the previous two creatures escaped from Superboy and Wildfire. But overall it's a rather straightforward well told tale as were so many issues of Legion of Super-Heroes under this creative team. Next time: "A sign of darkness dawning!"